Musical Instruments! - Do you play a musical instrument or did one of your family members? What instrument did you or they play? If no one in the family played an instrument, tell what is your favorite instrument or band and what is your least favorite one. Back in July of 2007, I wrote about my Dudelsack surname. "The Dudelsack was once perhaps the most widespread bagpipe in Europe." One theory about the surname's origin is that my ancestors were either makers or players of the musical instrument. However, the spelling of the surname isn't certain, and it could be "Dudelczyk." 'Dudel' is the Hebrew/Yiddish variant for 'David', and 'czyk' is a common Polish surname suffix meaning 'little' or 'son of'. This could be a more likely, but less interesting, origin of the surname. We tried out other instruments as well. Throughout elementary school I learned to play the violin using the 'Suzuki method,' which didn't require learning how to read music. When reading music was added to the curriculum, I dropped out. I preferred reading words. We have exciting news for those who are researching the Transylvania region of Hungary, as well as those who are interested in preserving our heritage. We have recently acquired a considerable number of register images from Bihar county, formerly in Hungary and presently in Romania, which contain around 12,000 to 15,000 records of births and marriages from this region. As you probably know, these records have been inaccessible until a few years ago and are not available on films from the Mormons. These records primarily include Nagy Varad (Oradea), Er-Mihalyfalva (Valea lui mihai), Margitta (Marghita), and Elesd (Alesd), as well as those of several smaller towns and villages in the region. They are seeking volunteers to help transcribe. My Deutsch ancestors were from the neighboring county of Kolosz, so they won't likely be in these records, but my Lichtmann ancestors were from Margitta. It seems fitting that this is announced a couple days before Halloween. But when a business closes its doors, and the doors remain closed for 23 years, you pretty much assume it's dead. There are those who will likely argue that if a business opens under the name of a business that died 23 years before, it's not really the same business, and they can't really claim "134 years of Public Service" or whatever the number of years of public service the former business claimed. Even if they hire some of the same employees. ST. LOUIS – Twenty-three years ago today the St. Louis Globe-Democrat published its last print edition. On Tuesday, December 8, 2009 the St. Louis Globe-Democrat will again serve the metro area as an online newspaper via our website www.globe-democrat.com. Dan Rositano, publisher of the Globe-Democrat, announced today that the site will focus on providing the best user experience in St. Louis, utilizing the latest technology and news distribution methods. The website will be a free service, and readers can register their e-mail addresses on the site beginning today, Rositano said, to receive more details about the technology and people that will make the site unique in St. Louis. Readers will also be able to sign up to receive breaking news, sports and topical alerts through email, smart phone or on their mobile phone. The St. Louis Globe-Democrat was first published on July 1, 1852 as the Missouri Democrat and in 1875 merged with the St. Louis Globe to become the Globe-Democrat. The newspaper’s last print edition was published on Oct. 29, 1986. Whether it is the return of a 134 year old newspaper that disappeared 23 years ago, or a brand new newspaper, it still could provide another news source for St. Louisans. The quality of that news source remains to be seen. The Jewish Publication Society Blog suggests the Five Best Biblical Names. Orginality. It’s one of the few things almost everyone wants. People dress in unique styles, dye their hair crazy colors, and tattoo their bodies, all in an attempt to be different from the pack. That’s how things are today. 1) Cain - You might think no one would name their child after the first person to commit murder. But according to my research, there were over 1200 Cains in the US in 1900, so that's likely 1200 sets of parents willing to do so. 4) Pishon - This isn't a person, but the name of one of the four branches of the river that flowed out of Eden. If you're going to name a child after a river, 'Pishon' is a much better choice than 'Mississippi' in my opinion. But don't get creative and name the kid, 'Pishoff.' That name has its problems. There is one Pishon in the 1910 census. 5) Methusaleh - Methusaleh lived to be 969 years old. There are no Methusalehs in the 1900 census, and there are very few people who are listed in the 1900 census, who are still alive today. Very Few. Coincidence? These are just my five favorite from the first five chapters. Imagine the names you could find if you read more than that! The word prompt for the 18th Edition of Smile For The Camera is "Travel." Planes, trains and automobiles. Horses, mules, carts, and wagons. Bikes or on foot. Show us your family and how they traveled. 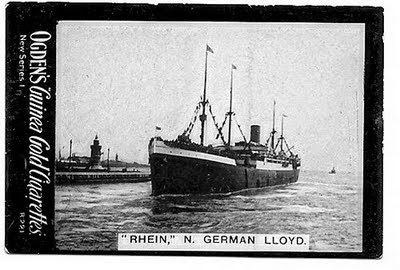 1) My great grandfather, Samuel Deutsch, and his children Jean, Ted, Ed, Martin, Jerry, and Bert came over on the SS Rhein in 1913. 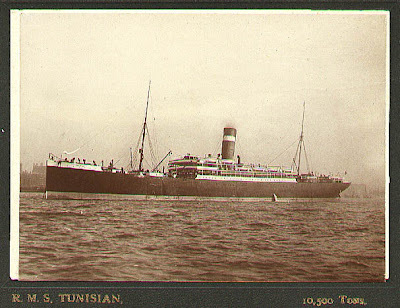 2) My great great grandfather, Selig Dudelsack, came over on the SS Spain in 1890. 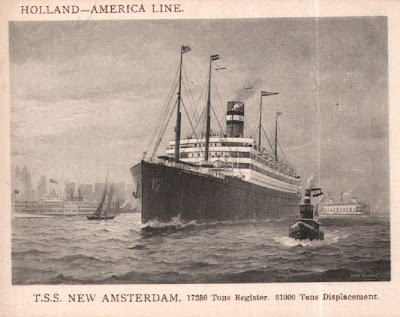 His mother, Gitel (Slupsky), his wife, Annie (Perlik), and their children Harry, Herman, Benjamin and Pearl came over on the SS New Amsterdam in 1891. 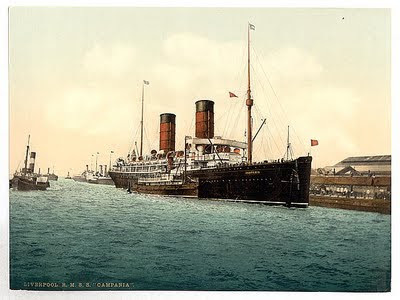 I am unsure of the ships or exact years of travel for my Cruvant or Blatt paternal ancestors. The rest of my maternal ancestors arrived in America before the age of photography. No. 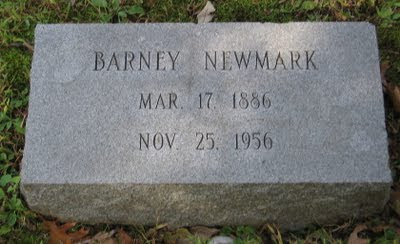 You may have noticed I glossed over a leg of the trip for my Newmark ancestors. You may have also noticed a ship in the group image at the top that hasn't been mentioned yet. All the ships above are from my ancestors' arrivals in American ports. 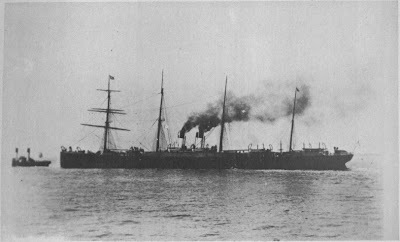 However, Samuel and Barney Newmark returned to England in 1908 from their initial exploratory expedition on the SS City of New York (aka SS New York). 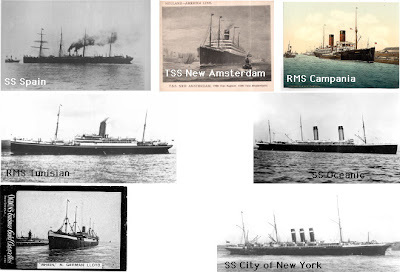 There's a bit of notable trivia about the SS New York. 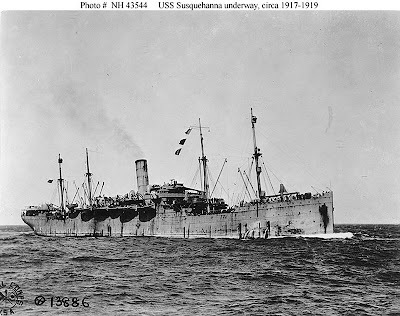 Four years after Barney and Samuel's voyage, on April 10, 1912, the SS New York was berthed at Southampton, England, when a larger ship passing through the harbor narrowly avoided hitting her. The New York was actually torn from her moorings, but otherwise escaped injury. 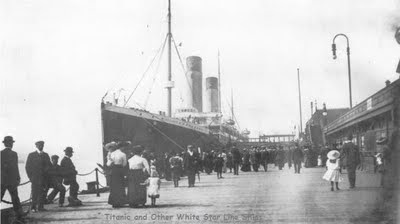 However, four days later, on April 14, 1912, the larger ship, the Titanic was unable to avoid another collision, this time with an iceberg. 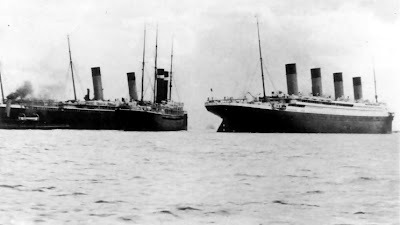 April 10, 1912: Titanic on the right, New York on the left. I have now posted photographs of the tombstones for 9 out of my 16 great great grandparents. I am uncertain where in Texas Ebenezer and Sarah (Hartley) Denyer are buried. Born in (or near) Warka, Poland, my great grandfather, a tailor, had a sense of humor when it came to writing his bio for a local Who's Who. He claimed to have been a native of Dublin, and to have studied at Oxford. He did spend 14 years in London, England from 1893 to 1907, but that is likely as close as he got to Ireland. He celebrated his birthday on March 17th, though April 14th is written down on a handful of documents, as well. It's uncertain which is true. I continue transcribing the tape my grandfather, Martin Deutsch, and his older brother, Ted Deutsch, recorded in 1977. This begins the second half of the recording - Day 2 - where their sister, Bert(a) Freed joins them. .
Martin: And the family would have been on the way to deportation. We sure don’t know the details as to where we were being taken, or anything like that, but if Bert actually had not been lost, we would have been on the way for deportation actually, and there wouldn’t have been any question, we wouldn’t have come back. Ted: That would have been the end of it. Martin: That would have been the end of it. But with one of the members of the family not being available, the whole thing was called off at least temporarily. Then whatever happened, why it stopped the whole thing and we weren’t deported. That’s how close we were to getting lost. Ted: Later on of course, about three or four months after this, Allen was born. And that changed the whole situation. Martin: I guess the fact that mother was pregnant with Allen didn’t make any difference, but after Allen was born, why then he was a citizen of the United States, and they wouldn’t deport the mother and father and keep the citizen, so I guess nobody was deported. So I guess we were saved after that regardless whatever else happened. And that’s actually the way it turned out. Ted: That’s the way it was. Martin: Now let’s go back to Hungary again, where we were living. What was the name of the town, Ted, I don’t recall. Martin: OK, I’m thinking of relatives. Mother’s parents, and Father’s parents, and their cousins, or whatever. You say that Dad’s, you remember Dad’s father you say. Martin: And he came over from Buchem I think you said, yeah. Martin: Torda, T O R D A? Ted: Right, he lived there, and he had a wife, and he drove many times over from Torda to Varalmas and visited with us. Bringing his wife, our grandmother, with him. Martin: He had children, I’m satisfied. Including Dad. Ted: There was one sister, two sisters here, in Chicago at the time. Living here. Ted: They were married. Well, One sister of his was Rosenblum. Rosenblum’s wife. Martin: Rosenblum’s wife was Dad’s sister? Ted: Yes. Another sister was Rose Greenfield. Married to Greenfield. Martin: That wasn’t Nathan Greenfield’s wife, was it? Ted: No that was Herman/Herschel Greenfield’s wife. Martin: I see, Herschel Greenfield and his wife, Rose, is it, was she called Rose? Ted: They called her Rose in English, in Jewish we called her Ruthel. I think Rose was the name that she went by. Martin: You better come close Bert if you’re going to get in here. You’ll be just a blind voice – you’ll be heard but you won’t be heard. Come over here and sit in a chair. Come on. Now, my recollection, I think you told me too, Rose Greenfield and her husband Herschel returned to Hungary after WWI. Ted: After WWI, that’s to my best recollection was after WWI they went back. Ted: They went back to Buchem where they originally came from. Dad had a brother who lived there, in Buchem. Who had been in the United States and went back before we even got there. Martin: Oh, yes, I see. You wouldn’t remember his name? Ted: David, Dovid they called him. David Deutsch. He owned a saloon over there. Ted: After he came back to Hungary he bought himself a saloon and settled in the same town. Ted: Long before we left Hungary he came back. But he had a son here, was Dexter, Herman Dexter. That was his son. He also had a daughter, Berta Newman was his daughter, and another one called Celia Palmer. Martin: Celia Palmer, I’ve wondered about her. Ted: That’s right. Hannie Goodman. Ted: Hannah Goodman was another one of his daughters. Bert: Don’t you remember the Goodman boys? Martin: Come on closer, I don’t hear you. Martin: I don’t think I do. Martin: Did they live in Chicago? Ted: Oh, yes, they lived in Chicago. At one time they lived on Evergreen Avenue, and one time they lived on Western Avenue. Martin: Of course my memory is always weak because I’ve been away from here [Chicago] for forty years and haven’t had any occasion to think about it or meet them, or something and in 40 years you really lose a lot of names. Ted: Those are all the daughters that I remember, and his son Herman Dexter. Martin: Now I do recall Herman Dexter very clearly because he used to come to Chicago from Grand Rapids, Michigan where he was living. I think he was teaching school there, and he was a coppersmith or something like that. Had a very good background in artistic work of some kind. Ted: He used to make artistic work, metals, copper, zinc, and he taught that in high school. Martin: I lost track of him completely. What happened to him? Is he dead? Ted: Well he passed on. He was married and had a wife. First wife died, and he got married again, and then he died and passed away. My grandfather not only has forgotten names from forty years prior, he struggles to remember what his brother told him the day before, such as the name of the town they came from, or the name of his uncle. Not to mention forgetting the name of a cousin he was told a couple seconds prior, and who he said he remembered quite vividly. I'm glad Ted (and Bert's) memories were better. I think there may have been some confusion over who were cousins, and who were uncles/aunts. Their father, Samuel Deutsch, was 20 years older than their mother, so there was a generation gap where they were the same age as some of their nephews/nieces. The daughter of their eldest sister, Jean, recently said she thought Samuel had a sibling named Regina who married Nathan Greenfield. I found out that Regina (Deutsch) Greenfield was actually the daughter of a brother of Samuel's named Albert. And she did marry a Nathan Greenfield. So is it possible a Rose Deutsch, sister of Samuel, married Herschel Greenfield, a brother of Nathan's? We'd have an Aunt/Niece marrying two brothers. Not impossible, but it's more likely two sisters or cousins were marrying brothers. But at least they're providing me names to research. Carolyn Barkley, at GenealogyAndFamilyHistory says Okotberfest is a good time to begin your German research, and she provides several resources. Denise Olson at the Graveyard Rabbit Online Journal shares several photos of cemeteries she found on Flickr, and she discusses Flickr Groups. Elizabeth Powell Crowe at Crowe's Nest suggests we read Symantec's article on Caution is Key at Hotspots, which is good advice for anyone with a laptop. Thomas MacEntee at Destination:Austin Family across several articles has shared a case history on his Search for the Living. He was trying to reunite a baby book with a family, but his tips can be applied to similar searches. Midge Frazel at Granite in My Blood asks what Perpetual Care means. Through the comments she receives, we learn it usually pertains only to the landscaping around the grave, though some cemeteries have actually removed a gravestone due to non-payment of perpetual care fees. NARAtions, the blog of The National Archives, has announced they will have a weekly Friday post, starting October 30, on Family History and Genealogy Research. They're calling it Family Tree Fridays. NARAtions announced earlier in the week that they began uploading their collection of Matthew Brady's Civil War photos to their Flickr account. Blood from a leech was used to identify an armed robber eight years after the crime. Missouri family adopts 22 children. Apple at Apple's Tree provides several transcriptions of letters. TK at Before my Time transcribes a section from Wonder-working Providence of Sion's Saviour in New England, which may reference her 9th great grandfather. 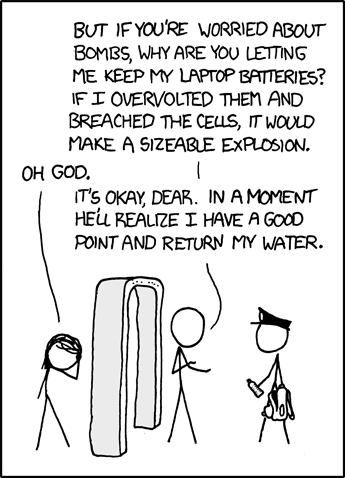 And while it has nothing to do with genealogy, I thought this XKCD webcomic was humorous. I was in a conversation with someone recently who had seen my blog, and they asked for advice. They were thinking about starting a blog, and didn't want to become one of the countless blogs out there with 1 to 5 posts, but then forgotten. I told them, as someone who has blogged on some topic or another since 2002, I feel the key is never to blog about something just because everyone else is. Write about things which interest you. Of course, I have the Curse of the Writer. You couldn't pay me not to write. Or if you 'found my price' I think I would go stir crazy. Take all that away from me, I'm sure I could find something to do. I'd certainly read more books. But what do you mean I can't write marginalia? Arggggh! So, no, I'm not going to stop writing. Ever. The only questions are where the words will be written down, who will see them, and whether or not I make any money. The Geneabloggers site has a good post on The Importance of Daily Blogging Themes. Followers of this blog have likely noticed that the space has been consumed lately mostly by daily themes. Amanuensis Monday, Tombstone Tuesday, Wordless Wednesday, Poetry Friday. And on either Saturday or Sunday I post my Weekly Picks. However, I chose (or created) the themes I liked. If the themes start to lose interest for me, or I run out of ideas, I'll stop that theme, and find something else to write about. There are a limited number of tombstone photographs in my current collection, and I will run out of direct ancestors in January, I think. I may post a few collateral photographs, but I'll probably be looking for something else to do on Tuesdays. I can probably extend Wordless Wednesday pretty far, even if I resort to posting from my family's collection of unlabeled unknowns. Amanuensis Monday will last awhile. I probably have a year's worth of weekly posts I could devote entirely to transcribing family history tapes, if I get permission from the required people to post them. I'm already struggling to come up with appropriate poems that are in the public domain, so I suspect Poetry Friday will be the first casualty of my current collection of themes. Geneabloggers is promoting Follow Friday, but I consider that the same thing as my Weekly Picks. I could move that up a day, but I have more time on the weekend to put the post together. I'm sure I will find something to write about. That has never been a problem for me. Since most of my paternal ancestors were residing in St. Louis from 1890-1905, and since the rest were in London, and since I have maternal English ancestry as well, I think Eliot definitely qualifies as a poet from an ancestral region. Many have suggested that the yellow fog in these stanzas was directly inspired by the factory smoke that filled the St. Louis atmosphere at the turn of the century.I believe this is the most direct reference Eliot makes to St. Louis in any of his poetry, though some have identified the "Brown God" in his The Dry Salvages as the Mississippi river. "I did not have, at the time of writing the poem, and have not yet recovered, any recollection of having acquired this name in any way, but I think that it must be assumed that I did, and that the memory has been obliterated." At the moment I have one more submission in mind. I've found a collection of Polish poetry in translation, but I have yet to select a specific poem. Nechama is the Hebrew word for 'comfort.' Common English variants dropped the first syllable and became Hanna or Anna. A great-great grandmother, Annie, her children, and her mother-in-law immigrated to America in 1891, a year after her husband Selig Dudelsack. She immigrated under the surname Feinstein. The family story had always been that Selig changed the surname in the immigration line. It's possible Annie or her Mother-in-law was responsible, or Selig changed it during the intervening year, and contacted them somehow. 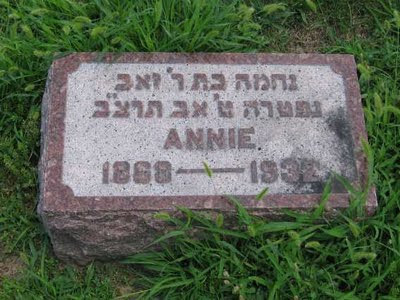 I have no photograph of Annie, even though I have seen several Feinstein family photos from the 1920s. I'm still hopeful I will find one. Finally. a meteorite did fall on Archie, Missouri on August 10, 1932. However, Archie is 280 miles from St. Louis, so I suspect the meteorite was unrelated to Annie's death. This week I transcribe a letter my maternal grandmother, Myrtle (Van Every) Deutsch, wrote to her sister-in-law Bert (Deutsch) Freed, in May of 1938. It was so sweet and thoughtful of you to call us long distance the other night. I was only sorry Martin was not at home to talk to you also. He seems to always miss out on your visits, telephone calls, etc. He came home the very next night. Last Monday night I had another "upset" and have spent the last few days in bed. It will be so nice not to be a Semi invalid after the baby comes. I have always been so husky and strong that it seems ridiculous to pamper myself now, but the doctor insists that I do. I am going to the doctor again tomorrow. Last month I lost two pounds and in the past three weeks gained back only four ounces of it. The doctor wants me to gain five or six pounds more, as he said one of my stature should gain more. I have gained 20 pounds so far, which is about average. Last week when I went to the doctor he said he didn't believe the baby would arrive until about June 15th, as I do not seem to have developed sufficiently. I hope he is wrong and the baby decides to come next week My bag is all packed and I'm ready to go. A number of our friends can't wait until the baby arrives. Monday I received a package from a girl friend in Texas containing a lovely satin print gown for ME and an adorable little dress for the baby. Another couple we know want to give the baby a comb and brush set, but they said they would have to wait to see if it is a boy or a girl so they can get military brushes if it's a boy. Besides they want to have the pieces monogrammed. The Tunneys have repainted the little crib they gave us, and Martin will have a new mattress made for it while I'm in the hospital. It is so nice of Mother to fix up the basket for us, and I do appreciate it. Martin said he thought he would wait and get the fresh tires when they come in. He will write you further about his wants. It seems to me that that's a pretty fine saving to make on the tires, and I'm quite sure he will take advantage of your offer to get them for him. Perhaps the three of us can drive up and get them later an in the summer. I had a nice letter from Sally and she was grumbling because you owe her a letter. She said for me to tell you if you didn't write, she wouldn't call you up on her visit to Chicago this fall. She will return there alone, as she and Joel are spending his vacation at some seaside resort this summer. His mother intends spending a couple of months with them soon. When are you going to have your tonsils removed? Don't neglect it, my dear, if the doctor advises having them out. There's really nothing to the operation and I know from experience that diseased tonsils can cause heaps of trouble. I had mine removed when I was in my teens, and their removal made a vast improvement in my health. I am supposed to think up some names today and make a list for Martin to look over tonight, so that we might agree on a name for our baby. I have practically let him name the boy, so I think he ought to permit me to name the girl. I was amused at him last night he said, 'I WANT YOU to choose the name!" But it seems every name I think pretty, he doesn't care for, so we’re still stymied. I still prefer Barbara Jane (my first choice) and I like Suzanne second best. But Martin frowns on both of these. He wants a very ordinary name, he says, but so far has made no helpful suggestion or named any preference. I think he would like to name a girl for Mother (your mother) and perhaps mine. My mother's middle name was Jane. But I doubt vary much if Mother would approve of using her name as it would not conform to the Jewish custom. Can you come to the rescue and suggest something appropriate? I'm glad the check arrived on Mother's Day and pleased Mother. Martin wanted to write on the card for her to buy a pair of shoes with the money, but I told him there might be something she wanted or needed more than shoes this year. I have been unable to get out lately. I had wanted to go downtown and get some house-dresses for her, but of course that is impossible right now. I know Jerry and Dorothy are "off me" because I haven't written them the itinerary of the Mexico trip that I promised them Perhaps I can get around to it within the next few days. Esther Linquist, who lived next door to us on San Bonita, is in Mexico now. She and another friend of mine, Hortense Sierk whom Eddie met, made the identical trip that Ed made last fall. They were in Mexico City when the country was threatened by that revolution last week. I have no special news for you, Bert, dear. Give my love to all the clan and tell them I'm looking forward to seeing them all during various week ends this summer. And lest but not least, depending on seeing you and Herman among the first visitors! My grandparents had been married about a year and a half at this point. Getting ready for the gift-giving season early, Gtownma has some Family History Gift Ideas. FamHist writes on how much the Find-a-grave website has changed in the past 9 years. Shades of the Departed points to Time Magazine's Top 10 Doctored Photographs of all time. The Genealogue finds a news story of how Slovakia is requiring tombstones carved in 'minority languages' to be recarved. footnoteMaven and Destination: Austin Family both have stories about surviving California's Loma Prieta Earthquake 10 years ago. JewishGen and Tracing the Tribe both have entries on the latest findings concerning the origins of Christopher Columbus. GenealogyBank celebrated its third birthday. I find they are an excellent resource for locating obituaries. The Google Blog has an entry on how to manage your online reputation/change your search results. This is information Jennifer Easevoli (who stands accused with her husband of defrauding Cisco out of $23 million) may need to take a look at, if it's not too late. Science Fiction author, John Scalzi, writes about how his local library, due to budget cuts, is now closed three days out of the week, and is open less hours on the other four. Genealogists often depend on the local library for research, and others may be facing similar cuts in their towns. This is my first entry in the Great American Local Poem Genealogy Challenge being hosted by West in New England. In Google Books I found Poetry of the Magyars: preceded by a sketch of the language and literature of Hungary and Transylvania, translated by John Bowring, 1830. Inside I found a poet named Emilius Buczi who was born in Kolosvar, Hungary. Kolosvar is today known as Cluj, Romania, and is nearby the town of Nagyalmas/Varalmas where my maternal grandfather was born. Buczi is a native of Kolosvar—his poetry is of the classic character, which has grown out of his great devotion to the writers of Greece and Rome. He was professor of rhetoric at Nagy Szeben (Hermanstadt), but ill health compelled him to abandon his chair, and to retire for some years to private life. On his recovery he was appointed to the professorship of moral philosophy at Karoly Fejervar (Karlsburg), which occupies him at this hour. In the below poem the author writes about what may be a local forest. Peace sings her hymns of solitude, Apollo ! Round the old roots what gentle streamlets murmur ! According to the Annals of the Kensington Methodist Episcopal Church (1801-1893), pages 77 and 79, a William Denyer is listed as a "Class Leader" in 1825 and an 'Exhorter' in 1827. The duties of an Exhorter are, to hold Meetings for Prayer and Exhortation wherever opportunity is afforded, subject to the direction of the Pastor; to attend all the sessions of the District and Quarterly Conferences, and to present a written report to the same. He shall be subject to an annual examination of character in the Quarterly Conference, and a renewal of License, to be signed by the President thereof. § 1. To see each person in his Class once a week at least; in order, (1.) To inquire how his soul prospers. (2.) To advise, reprove, comfort, or exhort, as occasion may require. (3.) To receive what he is willing to give toward the relief of the Preachers, Church, and poor. § 2. To meet the Ministers and the Stewards of the Society once a week; in order, (1.) To inform the Minister of any that are sick, or of any that walk disorderly and will not be reproved. (2.) To pay the Stewards what he has received of his Class in the week preceding. Born in the county of Southampton, Hampshire, England, Nov. 22, 1794; died in Louisana, Mar, 14, 1848. In early life he was a cabinet maker in Baltimore, Md, After marriage he was a farmer in Bucks Co., Pa., later he burned lime from oyster shells, in Philadelphia, was in ice business, rafted lumber down the Schuylkill river, boated on the Schuylkill canal, run saw and grist mill in Lycoming Co., Pa., and engaged in whip-sawing at New Albany, Ind. While there he was taken sick, and went to Louisiana for his health. In 1839 he settled with his family near Brazoria, Tex. In 1840 he moved to Gonzales Co. , Tex. , and in 1841 to Louisiana, and traveled as an itinerant minister of the M. E. ch., until his death. So it seems to fit my current knowledge, and it possibly dates when he began his professional career within the church. Roll cursor over photographs for additional information. person, or even about some place (like a river) or a local animal. 4.Submit your post's link to [West in New England] by November 22nd and I'll publish all the entries on Thanksgiving Day! However, we have been given more than sufficient time, so I will find a new one. 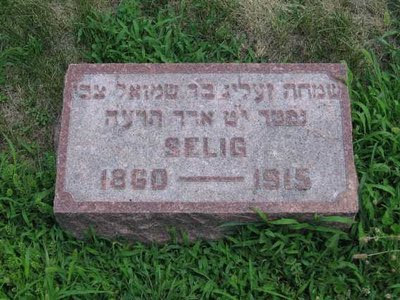 Selig Dudelsack was a second great grandfather, my paternal grandmother's paternal grandfather. When he immigrated to the US in 1890, he changed his surname to Feinstein. 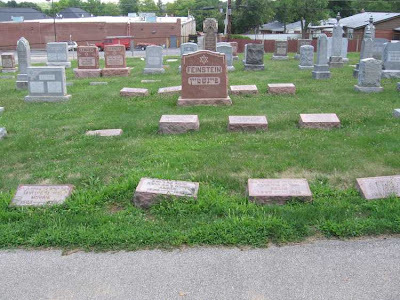 He is buried second from the right in the front row of the Feinstein plot at Chesed Shel Emeth cemetery in St. Louis. Next to his mother, Gitel. His sister, Toba, is in a nearby section. These photographs were among the first I took in my research, back in July of 2007. I continue transcribing the tape my grandfather, Martin Deutsch, and his older brother, Ted Deutsch, recorded in 1977. This 5-minute segment concludes the first 90 minutes. I follow it with a related news story, and some obituaries. Regarding the title of this post: I think most people assume a kidnapping is always a bad thing. That's not the case. Martin: Well we’re making pretty good progress here. One thing – we’re in the United States. We’re on Claremont Avenue, and you were just telling me about the Adamses and visiting them in Michigan in later years. When we were living there and we had seven in the family, Al was born there, too. Ted: No, Al wasn’t there on Claremont Avenue, he wasn’t born yet. Ted: Al was born in 1914, this was still 1913. Martin: Immigration was trying to ship us back. Martin: We came in ’13 in February this could be in the Fall. Ted: We were living in this basement and Dad got sick at that time. And couldn’t support the family. Ted: He couldn’t work. He had a job, but he had to quit. So, according to our affidavits nobody else could help. Those people signed the affidavits. So we became a public charge. Martin: Yes, and as a result, if you couldn’t support yourself. If you have no means of support you’d be shipped back. Ted: She was a friend of the Adamses that we knew, our next door neighbor. Our next door neighbor was Adams. Martin: I guess they all took an interest in this strange family that just came over with a half dozen kids, and I guess they kinda felt sorry for them and helped them. Ted: Yeah, something like HIAS they called it, Hebrew Immigrant Association, they still have it. [Note: Hebrew Immigrant Aid Society] And this banker was familiar with the deportation cases. He got in touch with the congressman, Sabath. At that time we had a congressman, Sabath. To see what they could do. And eventually, while he was working this way, the wagon came to take us away. Martin: We were actually that close? Ted: And disappeared with her, so they started looking for Bert. The rest of us were there. And they couldn’t find Bert. After...somehow they went away. They didn’t take all of us. Some other... Must have had some strings pulled somewhere in politics where they weren’t bothering us until this Sabath got a bill introduced in Congress to let us alone. Martin: I can’t imagine it being done so quickly, or absolutely. Ted: I guess that’s the way it was done. But that was the way it was explained to me. Martin: It usually takes months and months for anything like that. Ted: It took a bill in Congress to stop our deportation, and that was the only way to stop it. I, too, have doubts that legislation was passed specifically to save one family, however Congressman A.J. Sabath (1866-1952) from Illinois was a member of the Committee on Immigration and Naturalization [source] [source], so he may have had the power to pull some strings, or he may have helped pass legislation that did have an effect. If so, I have been unable to uncover the legislation referenced. Allen arrived in January of 1914, and once a child was born in the US, their status was never questioned again. Our family owes a lot to the quick thinking of a friendly teenager. It's possible this was a common practice, and she or others had done this before. Her action could have backfired horrifically - and probably would have in a different country in a different time. But American deportation authorities weren't about to separate a family. Mollie Adams became Mollie Britton, and she later ran a hotel in Sister Lakes, Michigan. A hotel at which I have learned Ted Deutsch and his family spent several vacations. Below are obituaries and a news story I have uncovered. Funeral Services for Mrs. Mollie Britton, 68 of Box 27, Sister Lakes, were held at 10 a.m. this morning at the Florin funeral home. Rabbi Joseph Schwarz of the Temple Beth El officiated. Following the services the body was taken to Westlawn cemetery in Chicago where graveside services will be held at 3 p.m. this afternoon. Among the survivors is a son Marshall Britton of Addison Ill.
DOWAGIAC – Harry E. Adams, 78, of Sister Lakes, died at noon Saturday in Lee Memorial hospital. He was born Sept 12, 1889 in Austria, the son of Benjamin and Rebecca (Rabbi) Adams. Mr. Adams and his brother Charles operated the Sister Lakes’ dancing pavilion, Ramona, for many years. He was past president of the Southwestern Michigan realtors association, a member of Temple Bethel of Benton Harbor, the Sister Lakes Chamber of Commerce and had been a past Exalted Ruler of the BPOE Elks lodge No. 889. Mr. Adams had been an active member of the Dowagiac Rotary club for many years. He had been associated with the real estate business in the Sister Lakes’ area, developing large tracts of lake-front property. Surviving are two sisters, Mrs. Michael Levin of Chicago and Mrs. Loretta Morris of Sister Lakes and a brother Samuel of Gary. Funeral services will be held Tuesday at 10 a.m. in the Temple Bethel. Benton Harbor. Rabbi Joseph Schwarz will officiate. Burial will be in Westlawn cemetery, Chicago. The Elks lodge will conduct memorial services this evening in the McLauchlin funeral home, Dowagiac. The family has suggested memorials be made to the coronary unit of Lee Memorial hospital. DOWAGIAC – Mrs. Loretta Morris, 85, of Sister Lakes, died Saturday afternoon in Schato nursing home in Dowagiac. Her husband, Aaron, preceded her in death in 1945. She is survived by one sister, Mrs. Jane Levin of Chicago. Services were held Monday at 10 a.m. in the McLauchlin funeral home with burial in West Lawn cemetery, Chicago. Sister Lakes – Britton Court, a local landmark for nearly a century, is being torn down to make room for a shopping center at Sister Lakes. Mrs. Mollie Britton had operated the hotel until this summer after acquiring it in 1927. As many as 50 or more persons were often accommodated she said in apartments or cottages. The cottages are being moved down by Round Lake and are for sale. The Britton property is at the main corner of the Sister Lakes community, across from the new bank. Past projects on the 50-acre farm have been the playhouse, Mollie’s Drive-in, a sub-division just getting underway, and a fire department. Mrs. Britton is selling her 13-room home, but will remain in the Sister Lakes area. Her sister, Mrs. Loretta Morris, lives with her. “This home is just too large for me anymore,” Mrs. Britton sighed. The home is known to her friends for its luxurious design and contents. The owner designed it herself, she said. Her new smaller home will be on Round Lake. This Saturday the 13-room home will go on the auction block, after an open house of three days. Contents of the hotel will be sold a week later, Aug. 5. The owner is saving the contents of her big home. Half of the Britton property will be subdivided this fall, 25 acres across the road to the west. The land where the hotel is being razed is to be sold for commercial and residential lots, Mrs. Britton said. The Digital Librarian's list of Genealogy Resources. FamHist has an entry on Watching Over My Shoulder. The feeling we sometimes may feel that someone (an ancestor perhaps) has been watching over our shoulder as we conduct our research, encouraging us, and celebrating with us once we unearth their existence. GeneaMusings writes on the process for adding information on Ancestry's 1930 Census. GeneaBlogie writes on the new Federal requirements for bloggers regarding product endorsements. From a non-Geneablogger perspective -- Comics Worth Reading also has an entry on this topic. GeneaBlogie also writes about "confidential marriages," which are only permitted in the state of California. An "in case of failure" message then-General Eisenhower drafted in case of the failure of the D-Day invation. Uploaded by the National Archives to their Flickr account. A Torah scroll that was loaned from a St. Louis congregation 45 years ago to the State of Missouri's prison system has been returned. The Rabbi hopes to send the scroll out on another mission. The Jewish Publication Society recommends five books of Jewish Humor. Some people may think I'm older than I am when I say this, but I noted with alarm the absence of author Leo Rosten from the list. I highly recommend his Joys of Yiddish, as well as his novel, The Education of H*Y*M*A*N K*A*P*L*A*N. (Originally published in the 1930s, Hyman Kaplan 'shouted' his name long before the internet - and he added asterisks!) The novel may feel somewhat dated at times, but its account of an immigrant's struggle with the English language is now classic. It's a commonly heard expression among writers. The footnoteMaven recently invoked it: Kill your babies. Those sentences you think are the most precious thing on earth - aren't. Who said it first - in what context? Note, he didn't advise you not to write the sentence in the first place. Give birth to the jewel, then put it aside. Quiller Couch is best known as the editor of The Oxford Book of English Verse. He also translated the fairy tales of Sleeping Beauty, Beauty and the Beast, Cinderella, and Bluebeard into English, though there were earlier translations. Apple writes about Creating a Blog Index. Her post made me think about my attempts at organizing the growing information on my blog. Originally, like her, I focused on the labels that Blogger provides (On other blogging systems they are often called categories.) And I had all the labels listed in my sidebar. A list that grew and grew. Recently Blogger added a feature that allows you to selectively add labels to your sidebar. (It's no longer all or none.) So now I have three listings: 1) Posts by Surnames 2) Posts by Locale 3) Carnivals and Memes. There are many other labels I have used in the past, and continue to use, but they are no longer in the sidebar. The only 'true' index I have created is an index of my Amenuensis Monday transcriptions, which I have placed on my main website - where I also have created some lists of genealogy resources. 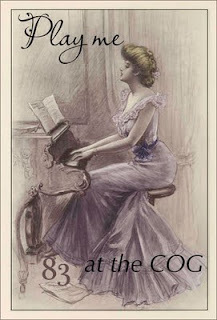 This blog may someday leave Blogspot and return to its original location. I moved it here at a time when there was nothing else genealogical on my website and I wanted to make this separate. The search features Blogger offers eliminates some need for indexing. The search box in the "Blogger bar" doesn't work very well -- it doesn't conduct an every-word search on the posts, and misses a lot. However, the Search Gadget they provide for the sidebar does a much better job. And recently they added the ability to search every page linked to from the blog, as well. I'm not certain how comprehensive this feature is, but it looks impressive. Billy Collins, US Poet Laureate from 2001-2003, may be my favorite contemporary poet. Here's a YouTube animation of one of his poems - a poem dealing with the forgetfulness we all begin to feel after we reach a certain age. The poem comes from his collection entitled The Best Cigarette, which he released via Creative Commons license. The video was created by JWT, with permission by Billy Collins, and this appears on their YouTube channel. The October issue of PastPorts (pdf) arrived in my email box this week. PastPorts is the newsletter of the St. Louis County Library Special Collections department. The newsletter is filled with tips for local researchers, along with a list of new print and microfilm resources at the library. Although Ancestry offers a database called “St. Louis City Death Records, 1850 – 1908,” there are differences between it and the St. Louis Death Registers: Deaths Recorded in the City and County of St. Louis, 1850–1908 produced by the St. Louis Genealogical Society in 2004 and available on public PCs in the Special Collections Department. It's a good reminder that one shouldn't always judge an online database by its title, and similar databases at a local library may actually contain more data. The Special Collections Department has also created some Research Guides which could be very useful for researchers new to the library holdings -- as they provide an overview of the resources available at the library, and there are individual guides based on geography, ethnicity, record types, and a few special topics. For visitors from out of town, they also have a guide for local lodging and dining nearby the library. I was also pleased to see the announcement that they have purchased four more combination Microfilm Readers/PCs with scanning software. (For a total of five) It's very nice to be able to save a copy of the microfilm page directly to a flash drive, as opposed to printing a copy out and scanning it in at home.